Schock sinks are among the most innovative designs in the kitchen accessories market, and HC Supplies stock a vast array of stunning models in a variety of colours and sizes. Our customers are able to purchase Schock sinks at reduced prices throughout the year, and our Schock sinks UK range is available with up to 40% off the recommended retail price. The German brand brings its sensational designs to the HC Supplies Schock sinks UK collection, allowing customers access to stylish, hardwearing sinks. Take a closer look and choose your perfect Schock sink today. Known for their outstanding, stylish granite sinks, Schock have been delighting homeowners with exceptional kitchen sinks for almost a century, honing their craft and expertise along the way. Enjoy beautiful designs such as the circular granite Schock kitchen sinks, and the Solido kitchen sink in gleaming white, or contemporary black. Add some extra space with our 0.5 Schock kitchen sinks, or update the entirewashing up area with a Schock kitchen sink 1.5 bowl and draining board combination. As all Schock kitchen sinks from HC Supplies are available at affordable prices, you really are spoilt for choice! When you buy your new Schock sink, you will want to know it will be arriving on time and in perfect condition. We employ experienced drivers who are trained to ensure goods arrive when expected and, of course, in pristine condition. Should you require your Schock sink to be delivered on a specific day, simply contact our helpful advisers after purchase, and we can arrange it. If you prefer, you can use the online form to contact us regarding any queries you may have and one of our team will get back to you as soon as possible. 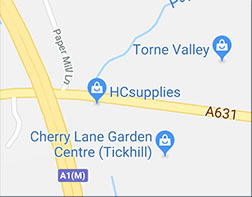 In addition to provding customers with access to reduced prices on all Schock sinks, we are also pleased to be able to give you the benefit of our design expertise if you live within 30 miles of our Doncaster showroom. Let us help you revive your kitchen, or simply come in store for some great ideas. Our staff are here to ensure you get the product you want at the right price. If you are in the area, why not pop in and take a look? If you can't make it to our showrooms, you can still discover the quality of our products by browsing our site. You will find a fantastic range of products to suit all tastes and budgets. We can deliver to any address in the UK, in Europe, and even further afield if necessary. This means that holiday homeowners, and developers can take advantage of our low prices and quality products. UK delivery takes from just 2 to 7 working days, and we can arrange delivery at a time that suits your schedule. Should you need assistance with any aspect of your purchase, give us call, or contact us online, and we will be happy to help in any way we can. Purchase quality goods at low prices from HC Supplies.